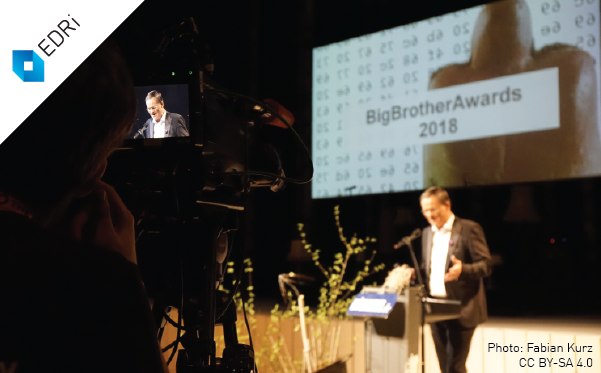 The annual German Big Brother Awards gala was held by EDRi member Digitalcourage in Bielefeld on 20 April 2018. Following last year’s 30th anniversary, Digitalcourage received more local recognition, and a cooperation with the municipal theatre began last autumn. This year’s Big Brother Awards became the first to be presented in the city’s main theatre. The award in the “Workplace” category went to the company Soma Analytics, whose health app “Kelaa” stands out among intrusive health apps as it only works if the users’ employers use the counterpart software, the so-called “Kelaa Dashboard”. The app records all kinds of data via the phone’s various sensors. It focuses on stress and sleep, encouraging employees and employers to “work on” these issues. The analysed data include phone use, voice characteristics, typing behaviour and even sleep movements, for which users are encouraged to take their phones to bed with them. The employer receives summary reports about their employees’ mental state. While this comes with the usual claims that the personal data is aggregated and anonymised, the reports do allow inferences to smaller groups in order to identify “most stressful” departments. An award in the “PR & Marketing” category went to the idea of a “Smart City”, with no individual winner. The award speech explained that what is touted as innovative and efficient, participatory and ecological, often becomes an entry point for total surveillance. CCTV can be “enhanced” with facial recognition and used, for example, to publicly shame transgressors by showing on monitors jaywalkers, completed with their personal data and automatic notification of employers (Shenzhen, China). People can be tracked with automatic alerts when they move away from their residence or workplace (Xinjiang, China). Street lights can be fitted with WiFi trackers and microphones to detect aggressive behaviour, and equipped with an option to spray scents to influence the people’s mood (Eindhoven, Netherlands). The projects are initiated by cities, but often the companies involved will treat the collected data as their private property. Citizens’ consent is not asked, but it is their data that is being collected and sold. The “Technology” award went to Microsoft Germany for implanting telemetry – the collection and transmission of diagnostic data – in Windows 10 and making it practically impossible to deactivate. Even if skilled users go beyond hard-to-find dialogs and make changes deep within the system’s registry, where more than 50 settings related to telemetry are known, the system still sends requests for updates, recommendations etc., causing at least the user’s IP address to be logged. The laudation concluded by calling Microsoft’s products an “intolerable problem”. In the “Administration” category, Cevisio Software und Systeme GmbH was awarded for their software for managing refugee shelters. Developed in collaboration with the Saxony branch of the Red Cross, the system stores personal data and registers movements and actions such as receiving a meal, receiving pocket money, borrowing books, or doing the laundry. This is merged with data from the Federal Office for Migration and Refugees to include information on family relationships and medical conditions as well as official documents and the state of asylum applications. The award highlighted this as a part of a trend of control-freakery that can be observed in other institutions’ interactions with refugees. Amazon’s “Alexa” assistant was given the “Consumer Protection” award for being a “nosy, impertinent, all-too clever and gossipy bugging operation in a can”, and the most award-worthy of several similar products. As the awards speech points out, Alexa is always listening and always online, sending what is being said after its “wake word” to the Amazon Cloud to be processed and stored. The assistant has an app with a function to list and play all conversation fragments – even months later. Together with the “Smart City”, Alexa is part of a process of public and private spaces turning against the people that are living in them. Patents held by Amazon, Google and others point to possible future developments that include identifying individuals and recognising moods from voices. The issue, according to the award speech, is not abuse – it is the potential that the system has even today. The parliamentary groups of the (conservative) CDU and the Green party in the parliament of Hesse were given the “Politics” award. These parties form the state’s coalition government, which is planning a new law regulating its domestic intelligence agency and a reform of its police law. The plans include allowing the recruitment of convicted criminals as undercover agents, and the exemption of agents from criminal investigation. Services will be able to undermine professional secrecy safeguards by recruiting holders of such secrets or placing agents in their contacts. The use of state trojans is to be allowed even as a “preventative” measure – an outright breach of an election promise by the Greens – and so is electronic tagging. The Green parliamentary group is pursuing these plans against a vote by its own party base, and the coalition as a whole is ignoring the overwhelmingly critical positions voiced by experts in a parliamentary hearing. As in previous years, coverage of the awards on the website is fully bilingual and can be found on https://bigbrotherawards.de/en/2018. The gala was live-streamed with English interpretation. A recording of the German stream has been published on https://vimeo.com/digitalcourage, a version with the English audio will follow.